Thorncliffe Park’s early history differs from St. James Town. Whereas St. James Town was an upper middle class area, Thorncliffe Park was farmland in the early 1900’s. It was home to a race track from the 1920’s until the 1950’s, when it was sold to Thorncliffe Park Ltd. which developed it in the late 1950’s as a public housing complex. 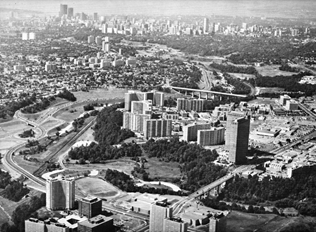 The development of Thorncliffe Park was similar to St. James Town and many other high rise complexes in Toronto during the 1960’s. The area consists of 34 high and low rise buildings along one main street within an area totaling 2.2 square kilometers. Today Thorncliffe Park is largely unchanged from its original development. The only real changes are some of its low rise residential buildings have been converted into offices. Thorncliffe Park, like St. James Town is an arrival city for new immigrants. It differs in that many of the immigrants that land here move on after they have settled. The area is quite poor as well with a poverty rate of 44% and an average household income of $46,275. The poverty rate is so high because of the low income housing that the area provides attracts many recent immigrants and people with a low income. The population has also grown considerably.The original development plan was designed for 12,500 residents but the area is home to over 19,225 people. It is believed to hold as many as 33,000 by residents of the community. Such overcrowding is compounded by the fact there is only one road in and out of the complex, so traffic is a constant problem. The large population is due to the large numbers of children in the area. The JK-5 public school is home to over 1,900 students, making it the largest in North America. Unlike St. James Town, Thorncliffe Park has many resources and services for the people living there. A shopping center, sports complex, Toronto Transit Commission (TTC) stops, churches and a public library all are within the area. All of this helps to settle people in the area and gives them space to move around which is good for their health. The residents of Thorncliffe Park want to improve the area for future generations. They have formed multiple committees that have put forward ideas for public works projects they want implemented. These projects will benefit the community and potentially benefit the incoming immigrants that choose to settle in the area. One such project is called Tower Neighbourhood Renewal (TNR) run by the United Way of Greater Toronto. The idea behind TNR is “to revitalize the community through the development of local partnerships between residents, landlords, social agencies and other stakeholders”. The improvements to date are: three community gardens, a mural depicting life in the area, and free programs at the community center. The city of Toronto in May 2014 approved a rezoning by-law for Thorncliffe Park to promote business growth.